(JillStanek.com) Well, isn’t this rich. SKDKnickerbocker is also the group Susan G. Komen for the Cure hired in 2012 when it was trying to fend off Planned Parenthood after deciding to break financial ties with the abortion giant. At the time, Komen’s then-vice president for public policy, Karen Handel, expressed skepticism of SKDKnickerbocker’s loyalty, precisely because of its long-standing alliance with Democrats and Planned Parenthood, as she later described in her book and to the Daily Caller. How ironic that only three years later Planned Parenthood is now the group in the hot seat. Who would have guessed? One can only hope SKDKnickerbocker is as successful now as it was with Komen. It also occurs to me that were Komen to try to disentangle itself from Planned Parenthood today, it would have no trouble, seeing as corporations are abandoning Planned Parenthood in droves, plus Planned Parenthood is a bit too stretched to muster a fight. 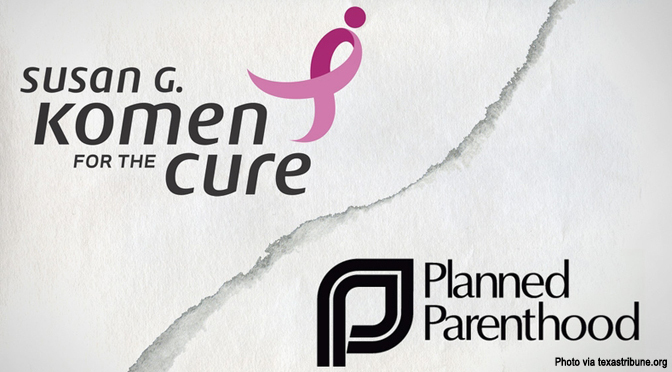 Only two weeks ago Komen lost a $4.75 million earmark from the sale of a commemorative coin over its relationship with the United States’ largest abortion provider. It’s not too late, Komen. How just it would be to pay back both Planned Parenthood and SKDKnickerbocker at the same time.